A Beautiful Wedding in a Romantic Oak Grove in Kent. A wedding party waiting for super tasty food. A sophisticated 21st birthday party in the grounds of a spectacular country house. A Baptism Party for 50 adults and 40 children. Our first private sit down dinner party of the 2016 season was a spectacular event – with guests enjoying a lavish menu in a wonderful house. We were asked to produce a menu using quality ingredients for a group of “meat loving” foodies who all love their food and great parties. We were lucky that the hosts kitchen was large with much bench space for plating up, cooking and preparation. The dining room where the guests were seated on two large tables was a short walk from the kitchen down a front hallway. All in all, for in-house private catering, it doesn’t get better than this. For the event we had three staff in the kitchen and two servers in the dining room including a professional mixologist on the bar who double up as a waiter. The main course was Prime Rib-Eye roasted and then carved into single steak sized portions. We decided to cook the rib-eye American style, very low and slow, to maintain moisture and when cooked medium the pink was right through the joint. This does take exacting timing, when you are cooking meat at 100 degrees and then wanting at least 45 minutes resting. Two complete ribs were seared at a high temperature than placed in the low ovens 4 hours before service. Every ½ hour we basted in Marrow oil and took an internal temperature reading. At just over three hours in the oven the internal temperature of the meat reached 63 degrees. We retrieved the meat from the oven and rested under foil for a hour. During this time we made fresh Béarnaise sauce and the marrow gravy, whipped up egg whites and them added to the already seasoned carrot puree for the carrot soufflé. Pre service briefing with the two wait-staff and kitchen staff in the hosts amazing kitchen. Scraping the bone marrow out of 8 large marrow bones. The marrow oil in the bottom of the pan after roasting was collected into a syringe and injected into the middle of each full rib-eye. The marrow chunks were warmed with the roasted pan juices to made an incredible sauce for those who wished to have more than the home made béarnaise sauce. For dessert we were asked to do do something simple and refreshing – so we choose a home made lemon posset – which we made very tart and lemony. We dusted with corn flowers and crystallised rose petal – and served with a lemon biscuit and our home made crystallised lemon skin. It’s always a joy to find something new and unheard of in the food business and I thought I knew the cheeses of France pretty well after 40 years of sampling the curd in all it’s magnificence. But on an ingredients buying mission to the south of France I came across a little backstreet cheese shop in Nice, well-off the tourist routes. 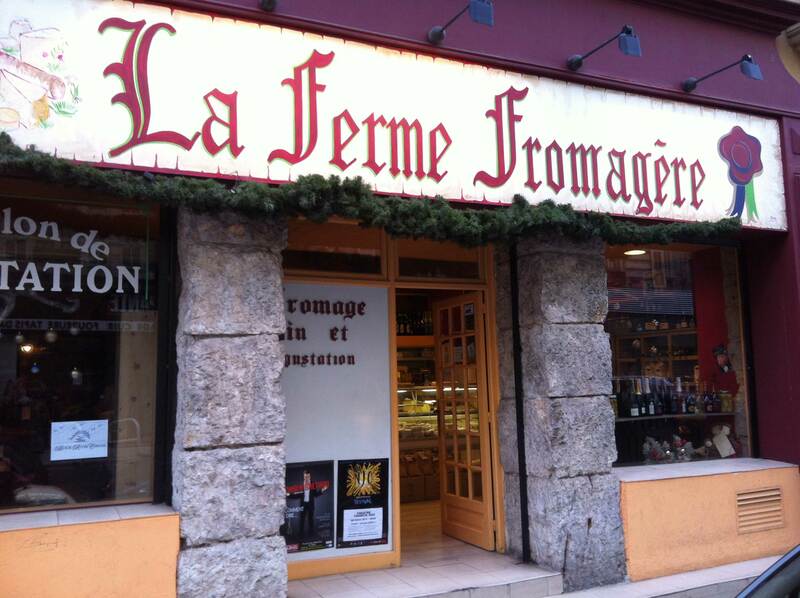 The passionate and knowledgable owner suggested I try a Cheese that he said is usually sold only at Christmas. He makes this himself – This is how he described it – Get a wheel of the best unpasteurised Brie at its honking best – slice it in half horizontally and fill it with a mixture of mascarpone, pepper, salt, diced truffle and real truffle oil (and other things he wouldn’t tell me) – put the other half back on and let mature for two days before serving. 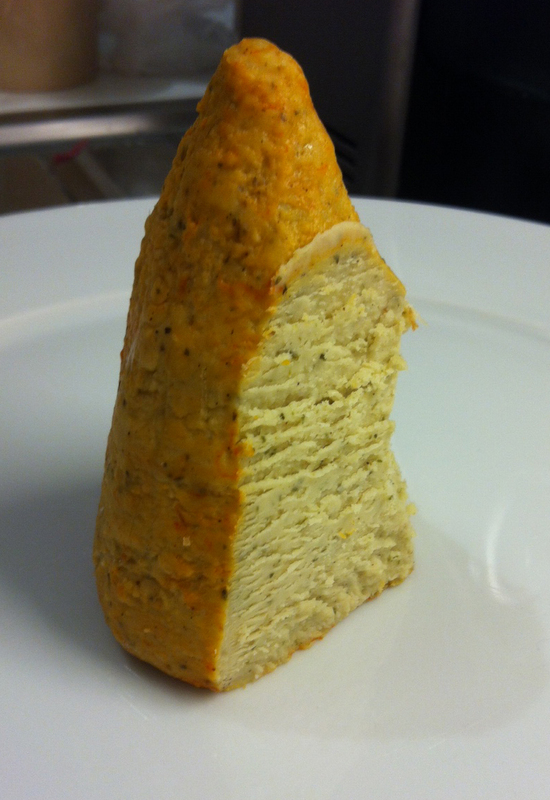 I am not kidding this is sooooo good I nearly collapsed onto the floor of the cheeses shop on first taste. 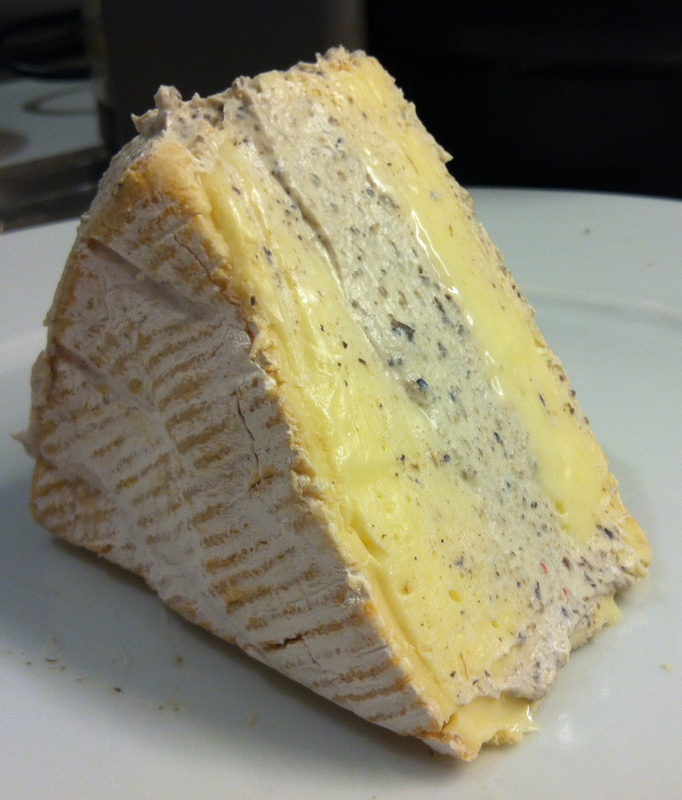 Cheesy, truffle delight -an incredible cheese. 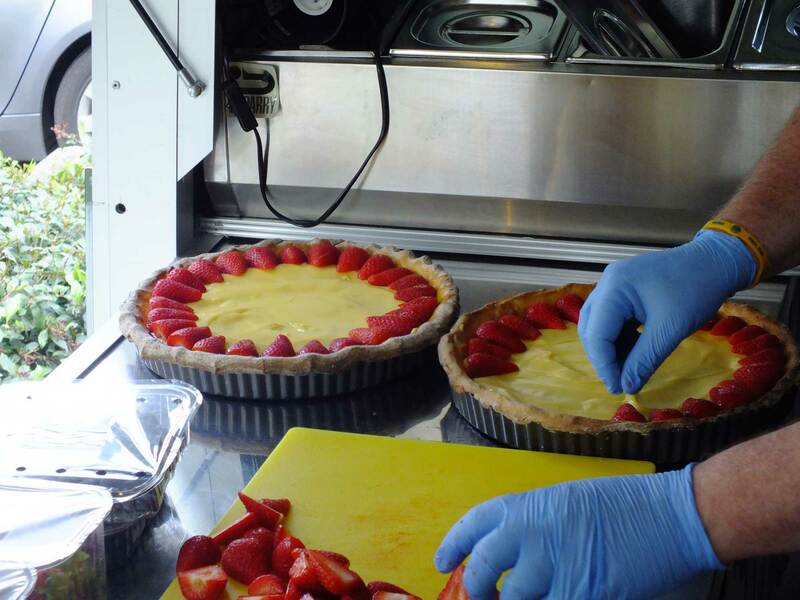 This saturday coming we are teaming up with “tarte” restaurant to bring the taste and flavours of the Deli Truck to the public. This is a special one night only affair starting at 1800 and ending when everybody is full. 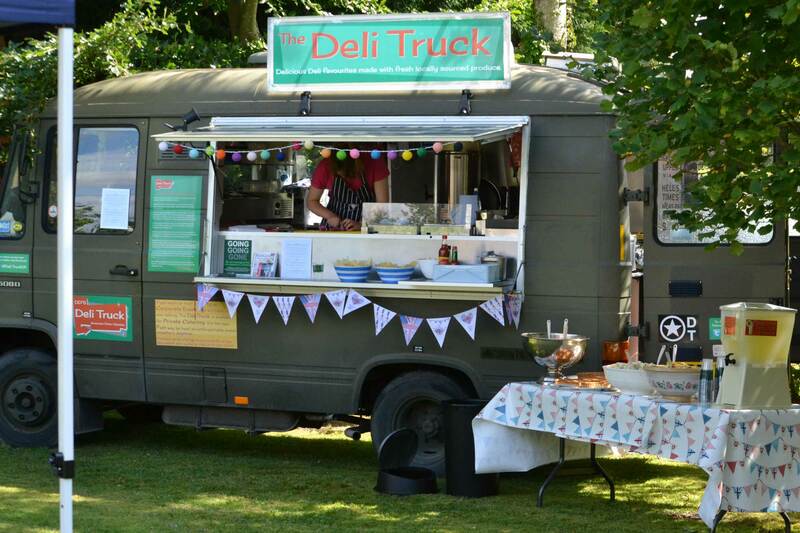 The Deli Truck will be parked outside the restaurant, opposite the village green, for service from 6.00 PM on the evening of the 16th of August. 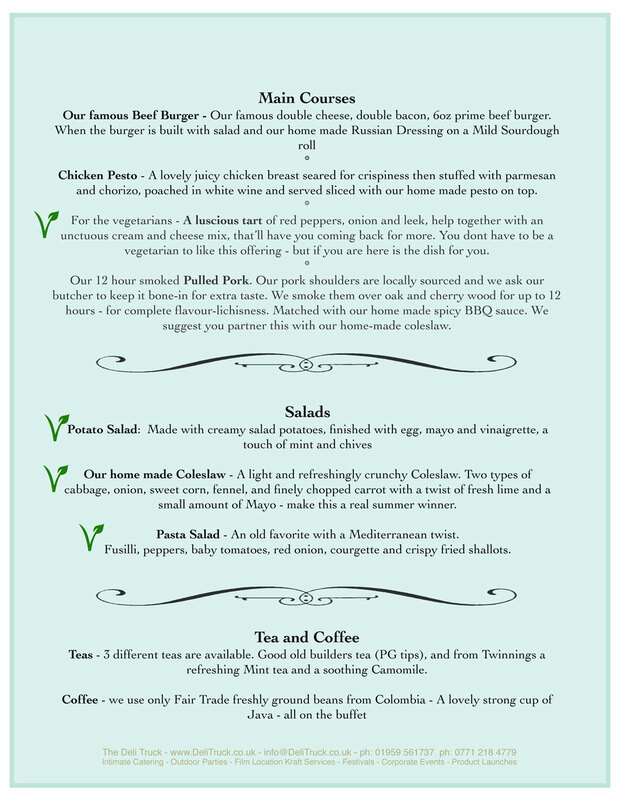 We have created a classic Deli Truck menu for the evening including our famous pure beef bacon and cheese burger, our spicy Cajun blackened Sea Bass sandwich served with our home made potato salad and finally our very successful 12 hour smoked pulled pork sandwich. As many of you knowThe Deli Truck tries very hard to be a responsible and eco minded food truck. For example all our disposables – that’s takeaway plates, cutlery and cups – are all bio-degradable and compostable. A number of clients have asked me what a compostable plate or cup means. So to clear up any ambiguity – the plates and cups we buy, if shredded and put into a compost heap, will have disappeared within 3 months. They are made of either vegetable starch for cellulose starch. We try to be a responsible with our food sourcing. 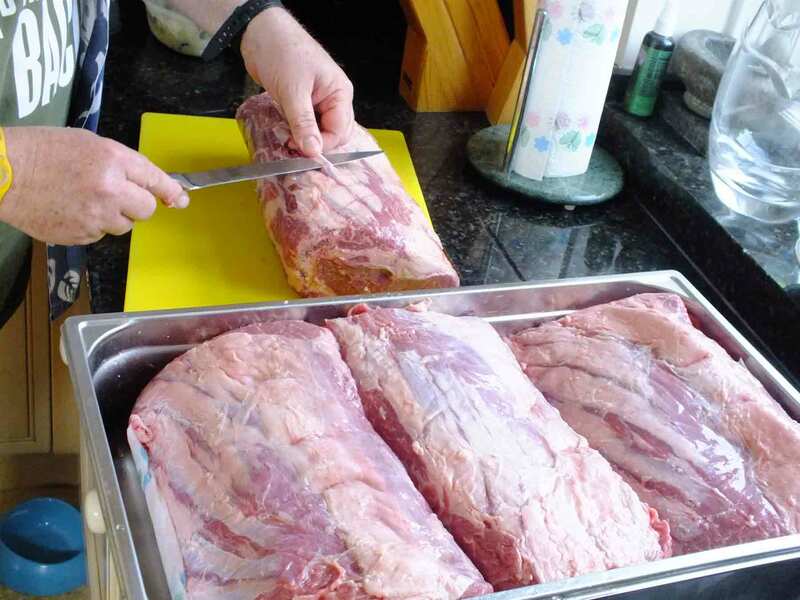 For the event at taste this Saturday – our burger meat comes from one 11.5 kilo piece of beef from the topside. ThIs will make around 65 x 6oz burgers. We cut the beef into manageable pieces that will fit through our grinder. When the beef is ground we form it into 6oz patties and add absolutely nothing to the meat at all. A good burger with good meat should be treated like a steak, add nothing to mixture – with only salt and pepper on the outside added during cooking. The same for our pulled pork – we get many compliments about this dish mainly because we take the time to do it traditionally. There are no shortcuts. we roll whole bone-in shoulders of pork in our special rub texas rub. 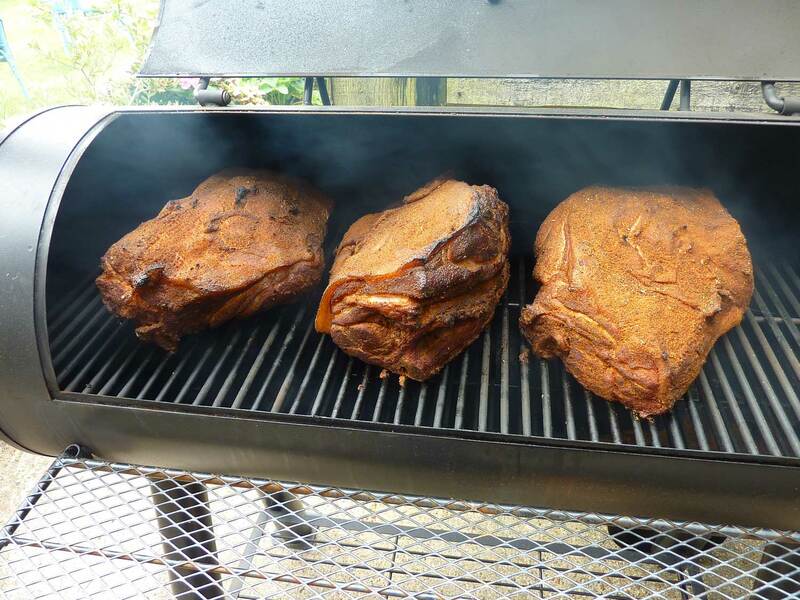 24 hours later we smoke it for up to 12 hours over oak and cherry wood. 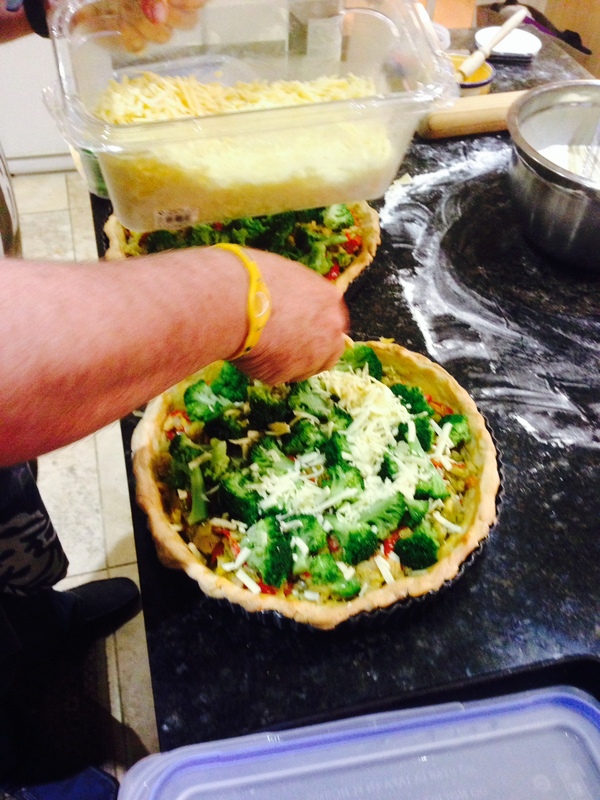 We then “pull” it apart and serve it with our spicy rich BBQ sauce, also home made to our own recipe. Our pork is locally sourced from Batchelors the butcher in Riverhead. Deli Truck pulled pork – 3 large shoulders of pork covered in our special texas rub for 24 hours before hitting the smoker for up to 12 hours. Hope you can join us on Saturday night – if the restaurant is booked out we will still be able to have some of the fastest American Style food in the South East – as will also be doing takeaways. 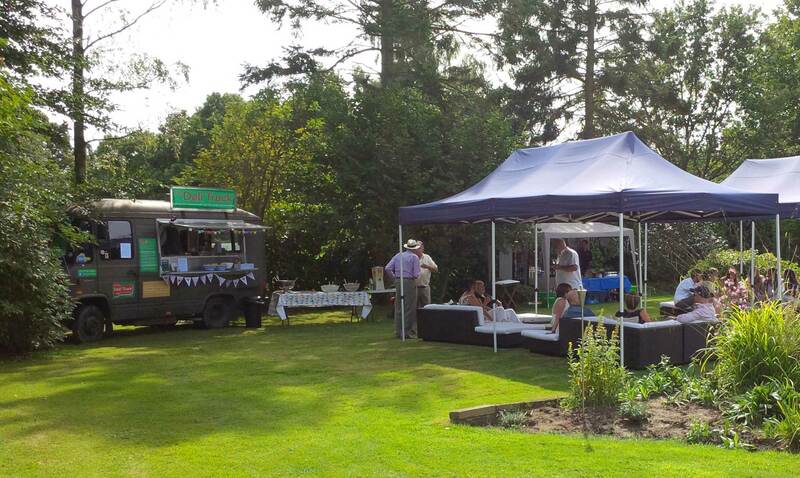 The organisers of this very stylish birthday party wanted a relaxed atmosphere in the garden and they got just that. With outdoor lounges and coverings for a shill-out area, a fully staffed wet-bar and the Deli Truck – the feeling was informal, chic, elegant and fun. And the guests certainly had fun. Guests started dropping in from 4.00 PM until 9.00 PM, with mosts staying on to drink and talk the night away until well into the small hours. We served a hot menu selected by the hostess from the truck with an accompanying buffet of salads and our home made lemonade – later we served freshly brewed coffee and tea. The menu was chosen in consultation with the hostess (it was her husbands 50th birthday) and turned out to be a real winner. We ended up cooking our spectacular burger which everyone seems to have heard about and always wants. 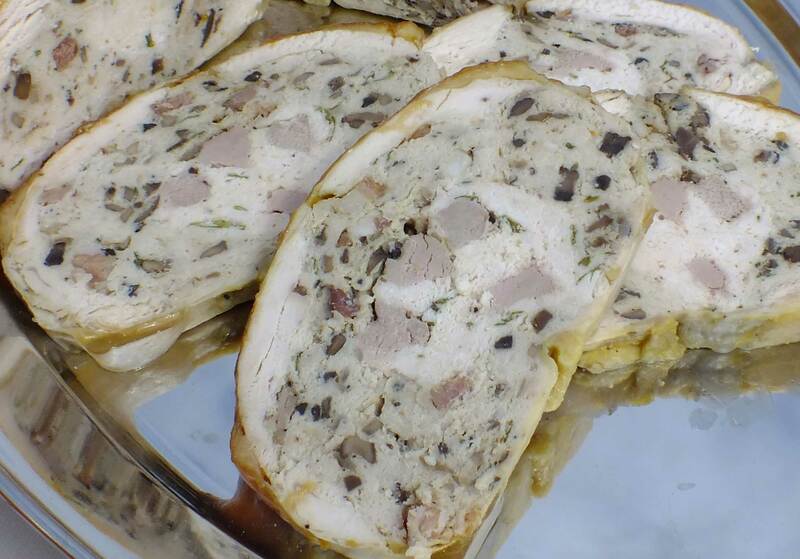 We accompanied this with our 12 hour smoked pulled pork which was a huge hit and chicken breast stuffed with chorizo and parmesan cheese, then poached in chicken broth, white wine and butter – served with a dollop of home made pesto on top. 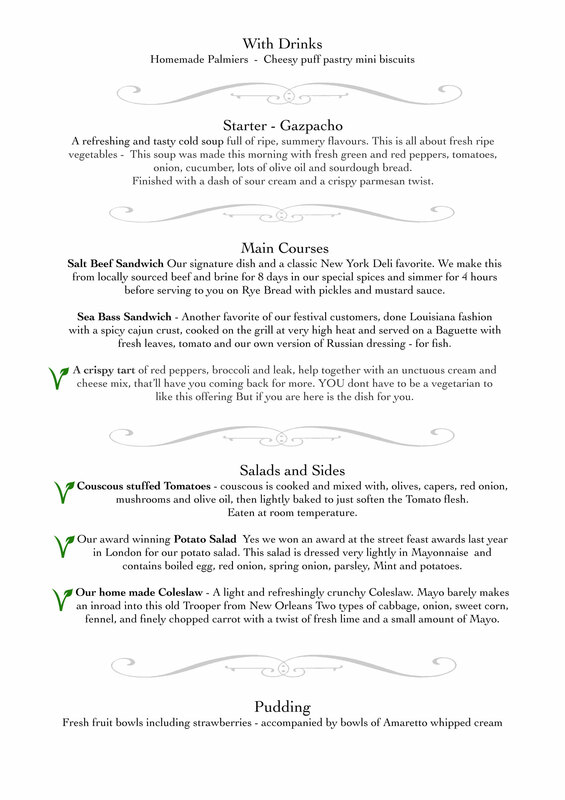 More details on the Menu are listed below. A big thanks to the most gracious and delightful hosts for their many kind words and support. We had a ball. One of our more unusual requests. An American client has asked me to feed his creative team for lunch tomorrow. It’s a surprise for their hard work. He specified smoked turkey cooked on a rotisserie accompanied by mac & Cheese, our special coleslaw, biscuits and gravy. Finished with key lime pie and pecan pie. A great American menu. But the turkey is certainly the king. We used charcoal for the fire and Oak and Apple wood for the smoke. It Looks fantastic. 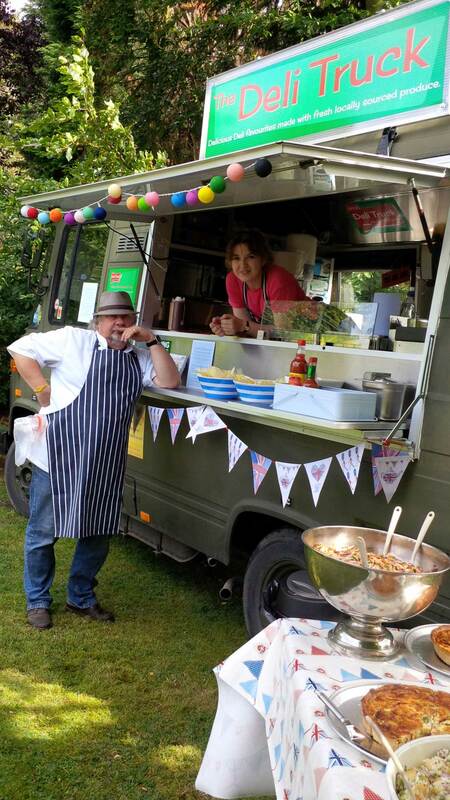 “tarte” of Brasted and the Deli Truck are bringing American style Gourmet Street Food to Brasted as a special summer celebration for one night only. “tarte” is well known for introducing innovative new menus and guest cooks to its Brasted eatery just opposite the village green. On Saturday the 16th of August you will be able to enjoy the renowned New York Style Deli food from the Deli Truck, while tarte will provide sides, desserts, wines and beers. All the food on the Deli Truck is made in house, even the BBQ and Burger Sauces are made by us. 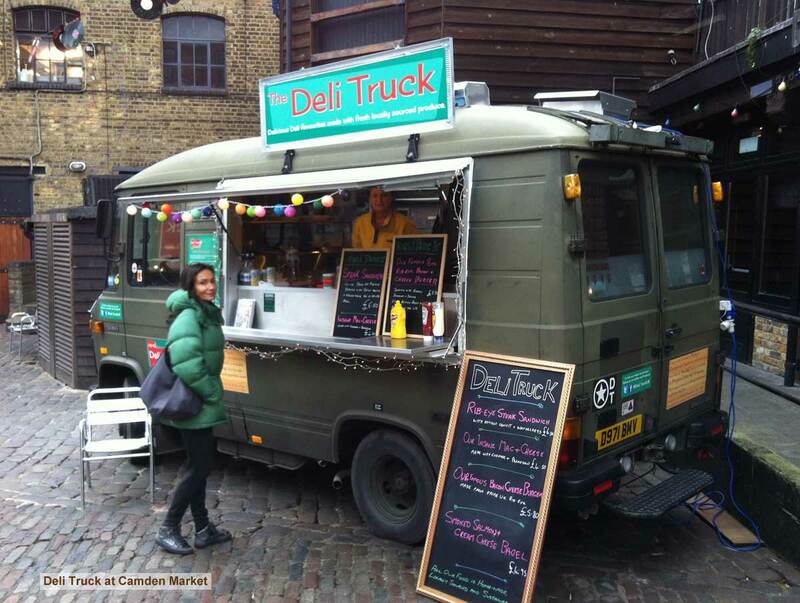 The Deli Truck has been hailed by one London critic as producing – “some of the best modern American street food in the UK”. So enjoy one of our hand ground double cheese and double bacon burgers – or our authentic 8 hour smoked pulled pork sandwich or our spicy cajun blackened fish sandwich. All the disposables on the Deli Truck – that includes cups, plates, knives forks and spoons are all biodegradable at least and in many cases are fully compostable as well. our plates are made of sugar starch and will compost in just 6 weeks our cold drink cups are made of plant starch and are fully compostable and biodegradable. But we don’t rest on our laurels – we are forever striving to bring you better quality food, with less additives and funny chemicals. We have just started our own gardens for suppling organic lettuce for our burgers and salads – and we hope this is just a start. 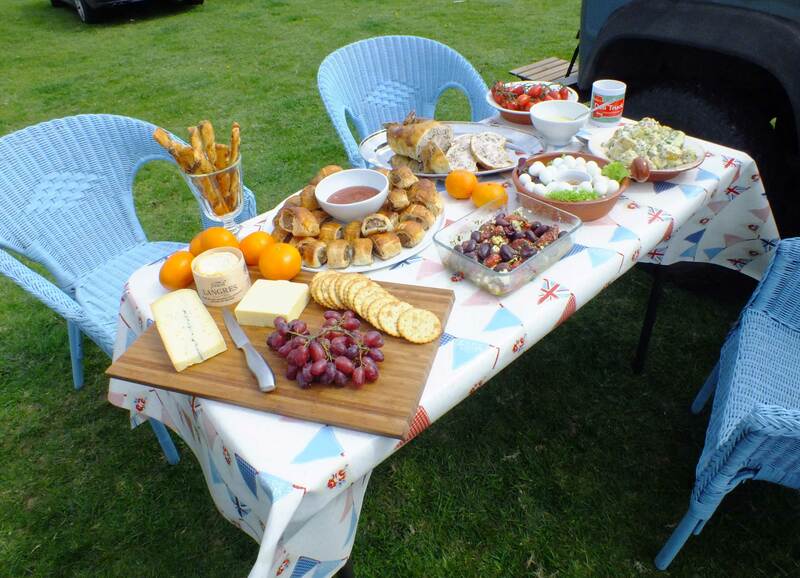 We were asked to feed fifty people for a summers day lunch in the gardens and grounds of a well know showbiz personality in Wimbledon in London. The menu was complex for the truck but it worked a treat and was a success because of organisation and premium ingredients. Can’t say who it is but a large garden in Wimbledon is our destination. 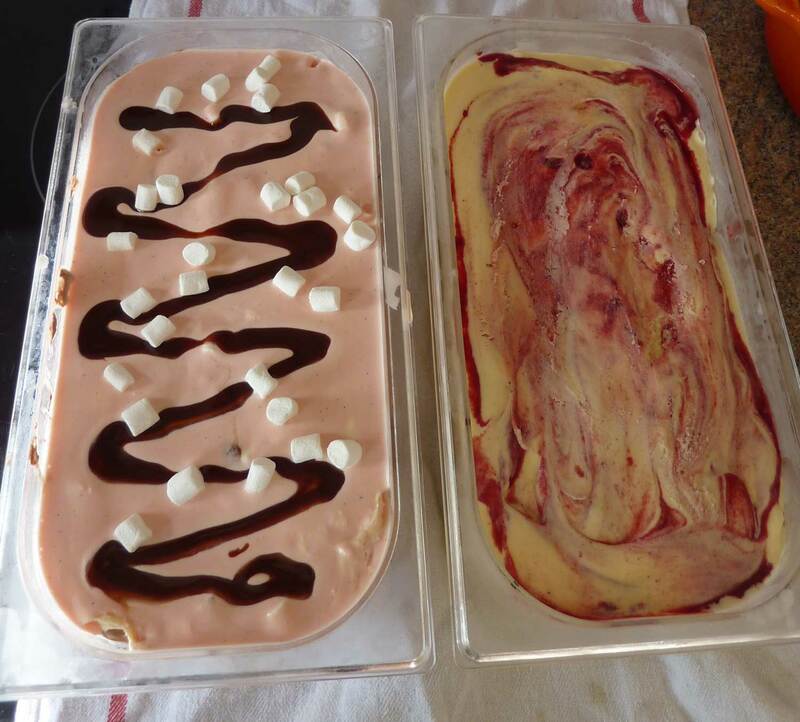 Starting at the end – dessert first – we have just finished making a gallon of two fabo home made ice creams. We use only organic milk and cream and made a fun one for the kids made up of vanilla, chocolate and strawberry ice cream layered with marshmallow and chocolate sauce. The second half gallon is made for the adult guests with a vanilla base brimming with a laughable amount of Disaronno liqueur for that lovely boozy almond flavour. Three layers of the ice cream are separated with a dark, compote of raspberries and then swirled. Kind of like the raspberry ripple we used to have as kids but with a serious kick and a little almond and berry bitterness to make it very grown up. The party is set to kick off at 12.30 Saturday, so running out of time – more posts as the preparations continue. Our two special home made ice creams. The host wanted the best – so we roasted 4 rib-eyes for the parties main course. I have to say this was one of the best pieces of beef I have ever ever had. We aged it for nearly 40 days, so it was super tender. This meat comes form our normal supplier, who I think is one of the best butchers in the UK. Graham Batchelor from Batchelor’s the Butchers (3rd Generation) in Sevenoaks. Preparing the beef feb-eye before a low, slow cooking. 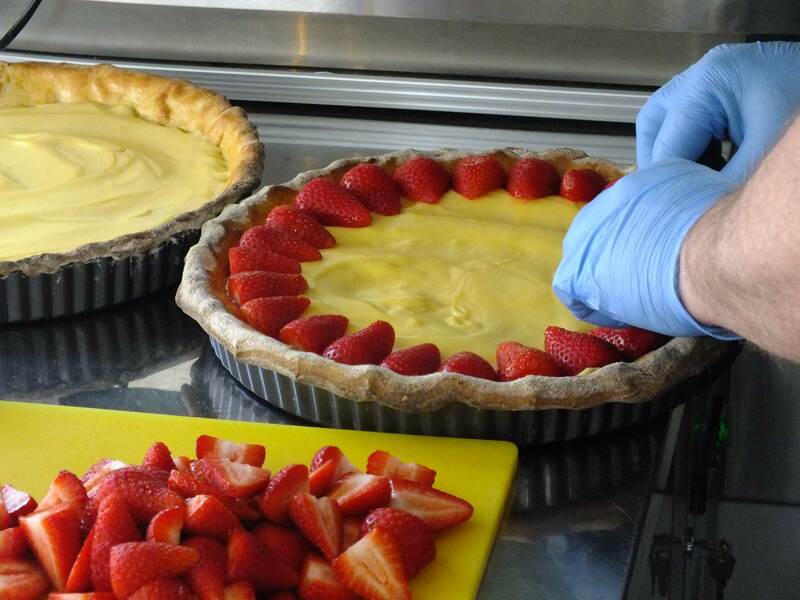 We kept prepping for the party on Saturday morning including finishing our strawberry tarts the traditional way with our homemade almond short crust pastry with Creme Patissiere and fresh strawberries. 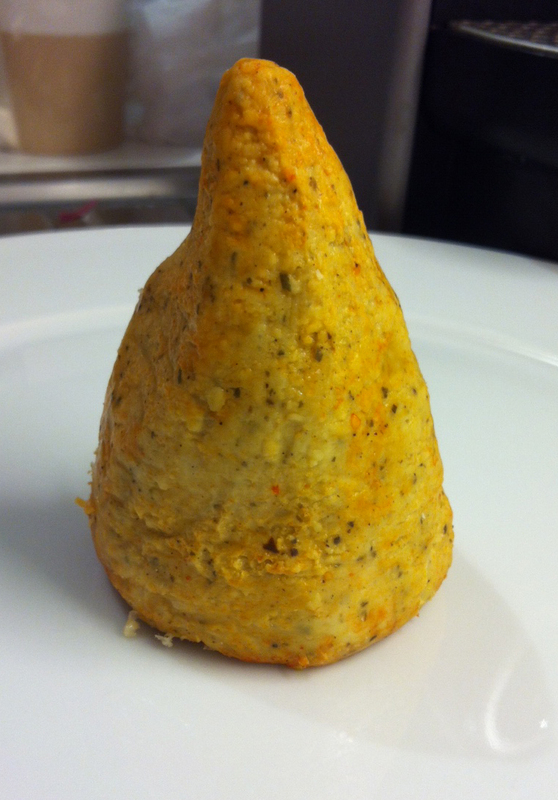 We also completed our hot smoked salmon entree. 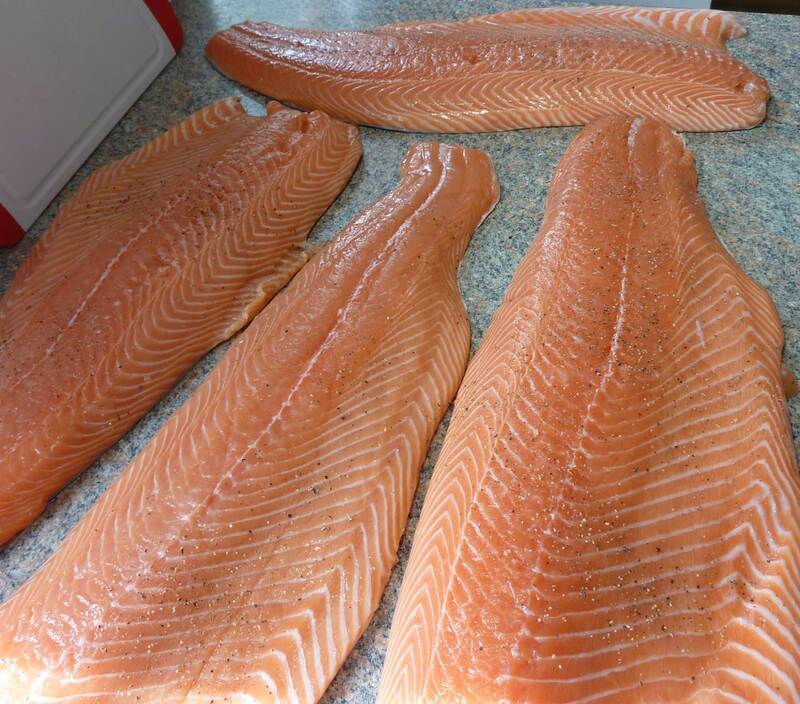 We cleaned four whole sides of salmon and hot smoked over apple and oak wood then served at room temperature over crispy salad leaves. 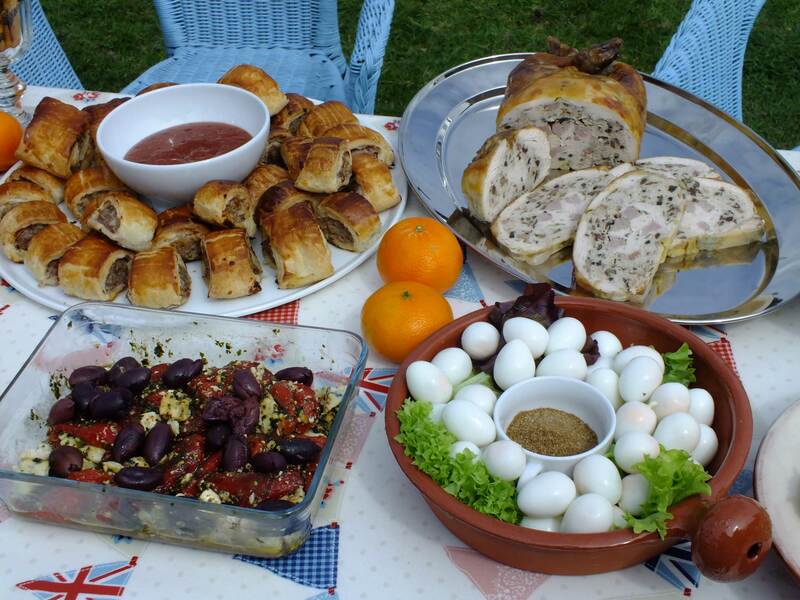 great smoky flavour but cooked..
We were asked to prepare a luxurious American style menu for a Christening Party in the grounds of a grand country house overlooking the Weald of Kent for 40 adults and 15 children. The host wasted smaller portions so that their guests could come back to the Deli Truck again and again if they wished to taste the whole menu – Diner style. 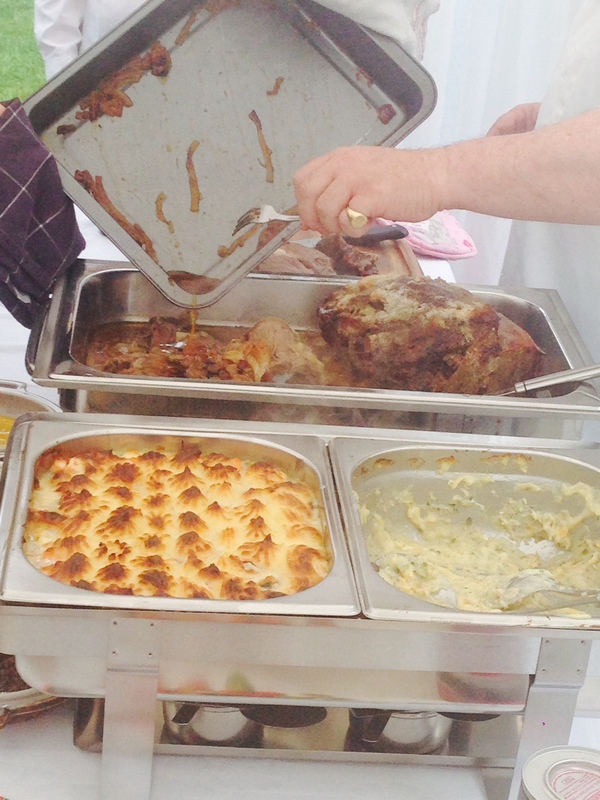 Hot dishes like the salt beef sandwich and the sea bass sandwich were made on the spot as the guests requested. Served this way the guests received their food at it’s freshest and best. We become the Gourmet Takeaway in the garden. 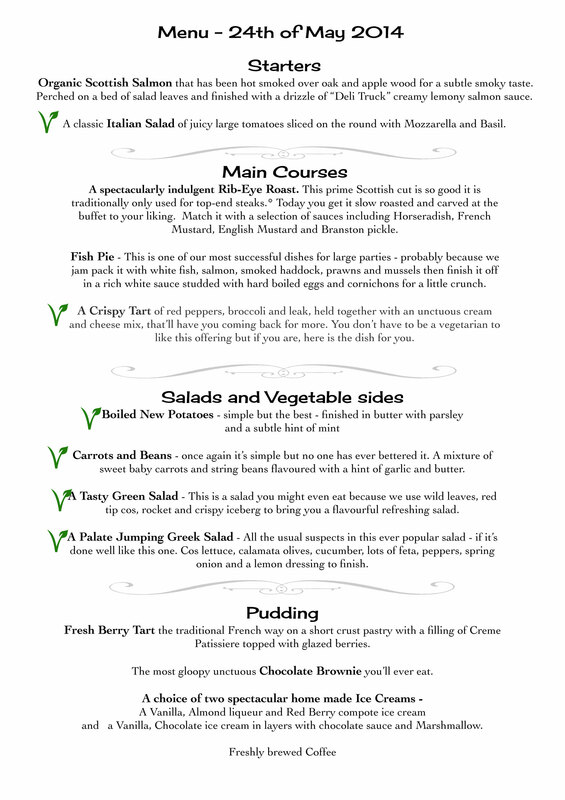 Menu for 40 adults at a Christening Party. The 15 children had a separate menu. 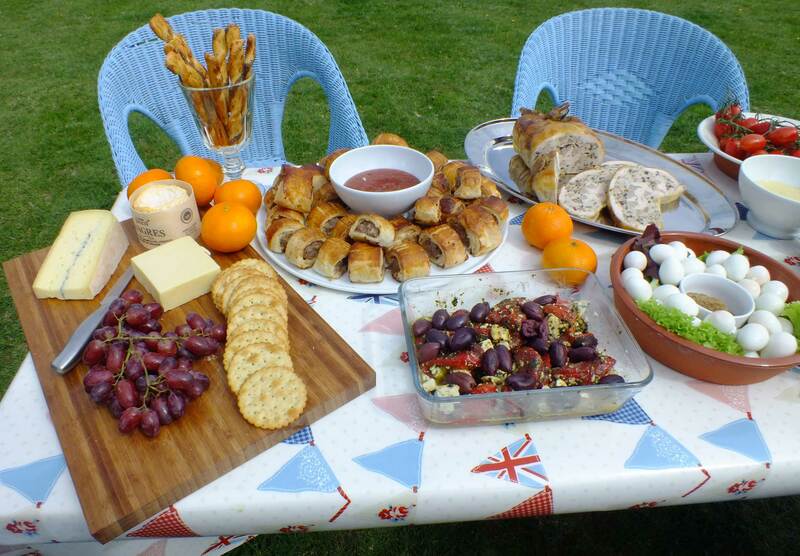 After all the work the picnic was a great success. The client was delighted and a steady stream of their friends dropped in for a chat and bite. 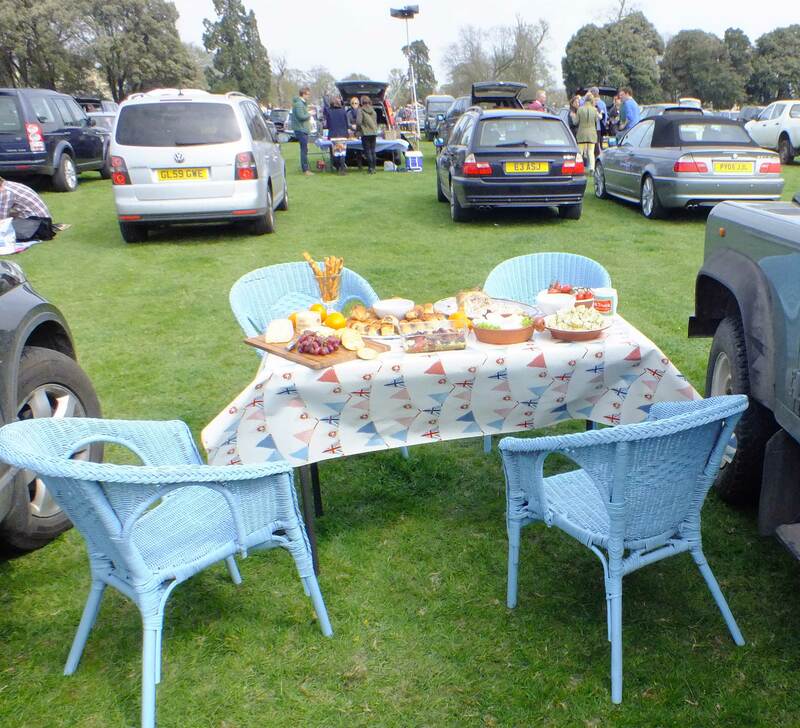 A delightful setting at the Penshurst point to point.